Our research focus is on understanding the mechanisms of longevity and cancer resistance. Aging is the major cause of death in developed countries. By finding ways to delay aging it will be possible to delay the onset of multiple age-related diseases. Cancer is another major killer in developed world, where 25% of human mortality is caused by cancer. Cancer incidence increases exponentially with age and to achieve long-life species must evolve efficient tumor suppressor mechanisms. Our goal is to understand such mechanisms in mammalian species that are naturally cancer-resistant. Cancer affects most, if not all, classes of vertebrates. The major tumor suppressor pathway appear to be conserved among mammalian species, however, the cancer rates are strikingly different. For example, up to 95% of mice die from cancer, whereas another rodent, the naked mole rat appears to be cancer proof. Human cancer mortality is 25%, which is in somewhat in-between the mouse and the naked mole-rat. In addition to its cancer resistance naked mole-rat is highly interesting due to its longevity. It has the maximum lifespan of 30 years, which is almost 10 times longer than a similar size mouse. We recently discovered that the naked mole-rat has a novel anticancer mechanism named “early contact inhibition” that contribute to its cancer resistance. We are interested in the genes and signaling pathways involved in early contact inhibition and in other mechanisms that contribute to naked mole-rat longevity and cancer resistance. Eastern grey squirrel is another very interesting rodent. Grey squirrels are common in cities and parks across the United States, but a few people know that these rodents have a maximum lifespan of 24 years. Squirrels express extremely high telomerase activity in all tissues, comparable to human tumor tissue. High telomerase activity is generally associated with increased cancer risk, therefore squirrels must possess unique mechanisms that allow them to stay cancer free despite the high telomerase activity. Yeast Sir2 gene is a histone deacetylase involved in gene silencing. Furthermore overespression of Sir2 extends yeast lifespan and promotes genome stability. Mammals have seven homologs of Sir2 named sirtuins (SIRT1-SIRT7). Deletion of mouse SIRT6 leads to premature aging and genomic instability. We are interested in the role of SIRT6 in genome stability and stress resistance. If all mammals were equally susceptible to oncogenic mutations and had equal tumor suppressor mechanisms one would expect that the rate of cancer would be proportional to the species body size and longevity. This is because greater number of cells and greater number of cell divisions would increase the chances of malignant transformation. Mammals range in body size from 30 g mouse to 110,000,000 g blue whale. If up to 95% of mice die of cancer by the age of 2 years it is paradoxical how come blue whales do not succumb to cancer in the womb. This fundamental question is named “Peto’s paradox” after Sir Richard Peto, who described it in 1975. The most plausible solution to Peto’s paradox is that the large and long-lived species have evolved superior anticancer systems. We are interested in understanding these mechanisms with the goal of using them to prevent human cancer. Enumeration of anticancer mechanisms in mouse, human, and blue whale. 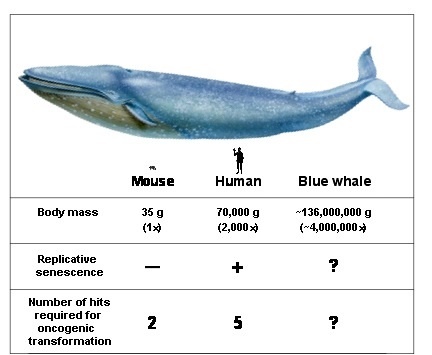 These three species differ in body mass by a factor of 2,000: human is 2,000 times larger than a mouse, and blue whale is 2,000 times larger than a human. Humans have multiple additional anticancer adaptations compared to mice. It is currently unknown whether whales have evolved many additional anticancer adaptations compared to humans. Body mass in large whales is difficult to measure. Therefore, the figures are approximate estimates. Van Meter M, Morello T, May A, Hubbard B, Bredbenner K, Sinclair D, Bohr VA, Seluanov A, and Gorbunova V. 2016. JNK phosphorylates SIRT6 to stimulate DNA double strand break repair in response to oxidative stress by recruiting PARP1 to DNA breaks.Cell Reports in revision after first round of positive review. Seluanov A, and Gorbunova V.2015. The next top models: The naked truth. Cell163(1): 18. MacRae SL, Zhang Q, Lemetre C, Seim I, Calder RB, Hoeijmakers J, Suh Y, Gladyshev VN, Seluanov A, Gorbunova V, Vijg J, and Zhang ZD. 2015. Comparative analysis of genome maintenance genes in naked mole rat, mouse, and human.Aging Cell. 14(2): 288-91. Xu Z, Zhang L, Zhang W, Meng D, Zhang H, Jiang Y, Xu X, Van Meter M, Seluanov A, Gorbunova V, Mao Z. 2015. SIRT6 rescues the age related decline in base excision repair in a PARP1-dependent manner.Cell Cycle, 14(2): 269-76. VanMeter M, Gorbunova V, and Seluanov A.2014.SIRT6: a promising target for cancer prevention and therapy, in “Anticancer Genes”, Editor: Grimm S., Springer. Van Meter M, Kashyap M, Sarallah R, Tian X, Seluanov A, and Gorbunova V. 2014. SIRT6 represses LINE1s by ribosylating Kap1 and the repression fails with aging and stress. Nature Communications,5: 5011. XuY, CaoY, LiZ, JiangY, SeluanovA, GorbunovaV, and Mao Z. 2014.Utilization of Rad51C promoter for selective killing of cancer cells. Oncotarget,5(7): 1805-11. VanMeter M., Seluanov A.,andGorbunova V. 2012. Forever young? Exploring the link between rapamycin, longevity and cancer. Cell Cycle,11(23): 4296-7. Gorbunova, V., Hine C., Tian X., Ablaeva J., Gudkov A.V., Nevo E., and Seluanov A. 2012. Cancer resistance in the blind mole rat is mediated by concerted necrotic cell death mechanism. Proc. Natl. Acad. Sci. USA,109(47): 19392-6. Mao Z., Tian X., VanMeter M., Gorbunova V., and Seluanov A.2012. SIRT6 rescues senescence-related decline in DNA repair by homologous recombination.Proc. Natl. Acad. Sci. USA, In press. Hine C., Seluanov A., Gorbunova V.2012. Rad51 promoter targeted gene therapy is effective for in vivo visualization and treatment of cancer.Molecular therapy, 20(2):347-55. Fong, V., Osterbur M., Kim Y., Hine C., Gorbunova V., Seluanov A., and Dewhurst S.2011. Adenoviral vector driven by a minimal Rad51 promoter is selective for p53-deficient tumor cells.PLOS One, 6(12):e28714. VanMeter M., Mao Z., Gorbunova V., and Seluanov A.2011. Repairing split ends: SIRT6, mono-ADP ribosylation and DNA repair.Aging, (9):829-35. VanMeter M., Gorbunova V., and Seluanov A.2011. Sirt6 overexpression induces massive apoptosis in cancer cells but not in normal cells.Cell Cycle, 10(18):3153-8. Seluanov A., Vaidya A., and Gorbunova V.2010. Establishing primary adult fibroblast cultures from rodents.JoVE, 8;(43). pii: 2002. doi: 10.3791/2002. Seluanov A., Mao Z., and Gorbunova V.2010. Analysis of DNA Double-Strand Break (DSB) Repair in Mammalian Cells.JoVE, Oct 5;(44). pii: 2033. doi: 10.3791/2033. **Selected for Faculty of 1000. Gorbunova V., Seluanov A.2009. Coevolution of telomerase activity and body mass in mammals: from mice to beavers.Mech. Aging. Dev., 130(1-2):3-9 (Invited review). Hine C., Seluanov A., and Gorbunova V.2008. Use of Rad51 promoter for targeted anticancer therapy.Proc. Natl. Acad. Sci. USA, 105(52) pp.20810-20815. Seluanov A., Hine C., Bozzella M., Hall A., Sasahara T.H.C., Ribeiro A.A.C.M., Catania K.C., Presgraves D.C., and Gorbunova V.2008. Distinct tumor suppressor mechanisms evolve in rodent species that differ in size and lifespan.Aging Cell, 7(6) pp.813-823. Mao Z., Bozzella M., Seluanov A., and Gorbunova V.2008. DNA repair by nonhomologous end joining and homologous recombination during cell cycle in human cells.Cell Cycle, 7(18) pp.2902-2906. Mao Z., Bozzella M., Seluanov A., and Gorbunova V.2008. Comparison of nonhomologous end joining and homologous recombination in human cells. DNA Repair(Amst), 7(10) pp.1765-1771. Gorbunova V., Seluanov A.2008. Rodents for comparative aging studies: from mice to beavers.Age, 30(2-3) pp.111-119. (Invited review) 21. Dion V., Lin Y., Price B.A., Fyffe S.L., Seluanov A., Gorbunova V., and J.H. Wilson2008. Genome-wide demethylation promotes triplet repeat instability independently of homologous recombination.DNA Repair (Amst), 7(2) pp.313-320. Mao Z., Seluanov A., Jiang Y., and V. Gorbunova2007. TRF2 is required for repair of non-telomeric DNA double-strand breaks by homologous recombination,Proc. Natl. Acad. Sci. USA, 104(32) pp.13068-13073. Seluanov A., Danek J., and V. Gorbunova2007. Changes in the level and distribution of Ku proteins during cellular senescence.DNA Repair (Amst), 6(12) pp.1740-1748. Seluanov A., Chen Z., Hine C., Sasahara T.H.C., Ribeiro A.A.C.M., Catania K.C., Presgraves D.C., and V. Gorbunova2007. Telomerase Activity Coevolves with Body Mass not Lifespan.,Aging Cell, 6(1) pp.45-52. Shi X., Seluanov A., and V. Gorbunova2007. Cell divisions are required for L1 retrotransposition.Mol. Cell. Biol., 27(4) pp.1264-1270. Gorbunova, V. and A. Seluanov2005. Making ends meet in old age: DSB repair and aging.,Mech. Aging. Dev., 126(6-7), pp.621-628. (Invited review). Seluanov, A., Mittelman, D., Pereira-Smith, O.M., Wilson, J.H., and V. Gorbunova2004. DNA repair by nonhomologous end joining becomes less efficient and more error-prone during cellular senescence.Proc. Natl. Acad. Sci. USA., 101(20), pp.7624-7629. Seluanov*, A., Gorbunova*, V., Mittelman, D. and J.H. Wilson2004. Genome-wide demethylation destabilizes CTG/CAG trinucleotide repeats in mammalian cells.,Human Molecular Genetics, 13(23), pp.2979-2989. * Equal contribution. Gorbunova, V., and Seluanov, A.2003. Telomerase as a growth promoting factor.Cell Cycle., 2(6), pp.534-537. Gorbunova, V., Seluanov, A., Dion, V., Sandor, Z., Meservy, J.L., and J.H. Wilson2003. Selectable system for monitoring the instability of CTG/CAG triplet repeats in mammalian cells.Mol. Cell Biol., 23(13) pp.4485-4493. Gorbunova, V., Seluanov, A., and O.M. Pereira-Smith2003. Evidence that high telomerase activity may induce a senescent-like growth arrest in normal human fibroblasts.J. Biol. Chem., 278(9) pp.7692-7698. Gorbunova V., Seluanov A., and O.M. Pereira-Smith2002. Expression of hTERT protects normal human fibroblasts from stress-induced apoptosis and necrosis but does not prevent stress-induced premature senescence.J. Biol. Chem., 277(41) pp.38540-38549. Gorbunova V. and A. Seluanov2002. CLK-1 protein has DNA binding activity specific to OL region of mitochondrial DNA.FEBS Lett., 516(1-3) pp.279-284. Seluanov, A., Gorbunova, V., Falcovitz, A., Sigal, A., Milyavsky, M., Zurer., I., Shohat, G., Goldfinger, N. and V. Rotter2001. Change of the death pathway in senescent human fibroblasts in response to DNA damage is caused by an inability to stabilize p53.Mol. Cell Biol., 21(5) pp.1552-1564. 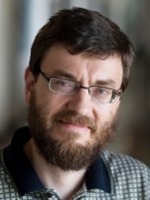 Seluanov* A., Herskovits* AA, Rajsbaum R, ten Hagen-Jongman CM, Henrichs T, Bochkareva ES, Phillips GJ, Probst FJ, Nakae T, Ehrmann M, Luirink J, Bibi E2001. Evidence for coupling of membrane targeting and function of the signal recognition particle (SRP) receptor FtsY.EMBO Rep. 2(11), pp.1040-1046 * Equal contribution. Zelazny, A., Seluanov, A., Cooper, A. and Bibi, E.1997. The NG domain of the prokaryotic signal recognition particle receptor, FtsY, is fully functional when fused to an unrelated integral membrane polypeptide.Proc. Natl. Acad. Sci. USA, 94(12), pp.6025-6029. Seluanov, A. and Bibi, E.1997. FtsY, the prokaryotic signal recognition particle receptor homologue, is essential for biogenesis of membrane proteins.J. Biol. Chem., 272(4), pp.2053-2055. Gorbunova V. and Seluanov A. (2009) A comparison of senescence in mouse and human cells, in “Senescence and Cancer”, Editors: Sedivy J. and Adams P., Springer. Gorbunova V., Seluanov. A., and Hine C. (2008) Use of Rad51 promoter for transcriptionally targeted anticancer therapy. Invention disclosure # 6-1652, Pending.